Summary: The government are being told by their ambassador to the EU what has been obvious for some time: the route towards Brexit is much more complicated and fraught than most of the public and much of the media realise. Negotiations are notionally with the EU but in fact with 27 separate nation states. Each has its own view on Brexit and the future of the EU. The political landscape across Europe is changing and the UK will be faced with negotiating with a rapidly changing EU. Many key countries face significant internal political upheavals. The probability is that only a hard-Brexit is possible in the time available. The economic damage caused by the threat of Brexit will become even more obvious to UK citizens as time goes on. Clamours for a second referendum will become irresistible. There is increasing evidence that the whole Brexit Fraud is unravelling. The vote was one when the public were presented with a series of implausible lies that the Brexiteers packaged convincingly to fool the public. Now the British ambassador to the European Union is reporting that the widespread view within Europe is that negotiations for a trade deal could take up to a decade. The bland assurances of the government and the Brexiteers that this can be handled comfortably within a two-year window are patently nonsense. Sir Ivan Rogers report makes the greatest of sense. There are other signs of the Brexit fraud unravelling from the government itself. Number 10 is adamant that everything is going swimmingly. Their approach is very much cast off the ship and we will start the engines later. Any sailor will tell you how foolish such an approach will be. The Chancellor, Philip Hammond, said earlier this week that all thoughtful politicians were clearly in favour of striking a transitional deal with the EU. David Davis, the Brexit Secretary, now appears to be in favour of a transitional deal. Even the hard-core Brexiteers, all wealthy and unlikely to be affected by any Brexit themselves are going rather quiet. Brexit has fallen write down the running order on the main pro-Brexit right-wing newspapers. What do those who want to Remain in the EU, like the author of this piece, do about all this? Probably sit tight and wait for the unravelling to continue and indeed it will accelerate. Within a couple of years the economic effect of threatening to leave the EU will become more apparent in terms of significantly rising prices probably combined with a small drop in employment. We will also see the substantial cuts to benefits and public services already forced on the government to compensate for the costs of leaving. The great majority of the population will feel a marked tightening of the belt and a realisation that things are going pretty badly for most people. It is unlikely the government could go ahead with a hard-Brexit, resorting to WTO trade rules without a general election or a second referendum. The Leave campaign are adamant that a second referendum should not be held. They realise the lies they told about the EU-free paradise we were heading towards are already unravelling. They are concerned that if another was held they might well lose it. That risk will increase in the future as the whole fraud of the Brexit case is exposed. However, if there is a significant popular opinion against a hard-Brexit that second referendum might become irresistible. That would hopefully conclude this whole sorry business. A major distraction for the UK (and for the EU), for no productive benefit, delaying the return to real growth in the standard of living for the vast majority of citizens here. Labour are showing no sign of engaging with this seriously. We all rather wonder what they think. Things are getting complicated. You say you have been anti nationalist all your life and that you are not prepared to give up on the European Union. I presume therefore you voted No in 2014 and Remain 2016. If I am correct you won one and lost one. This puts you in a half way house. You are exactly the kind of voter the SNP need to persuade to their cause. The possibility of a general election before the UK leaves the EU is I agree, more probability than possibility. I can see the Tory government having to call a GE to ratify the conditions of Brexit. If so, it does throw up opportunities for all parties especially those in opposition. (One parties opportunity is another’s risk, look out Labour). But the problem pro EU parties will have is, what will the EU will look like at this time. The Brexit result has created massive unforeseen problems for all UK political parties and more so for the institution that is the EU. There are too many unknowns to speculate on all the different outcomes that could arise. As I said in my first comment, these days I prefer to watch the drama rather than play any part in it . Yes, that is exactly how I voted. My anti-nationalism is, however, against encouraging the dog-eat-dog approach to international relations that Europe has been so damaged by for hundreds of years. The whole concept of 28 nations working in some sort of harmony is something that I fundamentally believe is right. I think you are right in saying that there is great potential instability within the EU but I do feel that the UK could contribute much more constructively from within the EU to sorting out the issues which appear to be so widely accepted within the countries of the EU. Freedom of movement is disliked in its present form pretty widely. 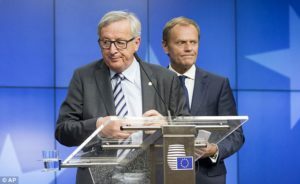 The way that an unelected secretariat seems to get away with running the institutions and levers of power within the EU without much interference is a real problem. But I basically believe that what the EU has achieved so far is too important for it to be thrown away. I do believe that without the UK the EU will have serious problems, most likely triggered by Eurozone issues as populist forces reject austerity leading Germany to withdraw funds from the ECB. The UK could help direct and re-engineer the European project from within but not from outside. Better, I feel, that we hang together than hang apart! There will not be a second referendum, not in Scotland on Scottish independence nor in the UK on leaving the EU and nor should there be. Stop deluding yourself. It is a waste of your time. The people have had their say. Accept the result. I have. I was on the loosing side twice, but it took me no more than hours to accept Scotland is part of the UK. It has been for 300 years and it is destined to remain as part of the UK. That is what the Scottish people want. That is what they voted for. You should apply the same mind set to Brexit. It is really quite liberating. Watch it happening. Read about about it but dont oppose it. Its politics. There are no absolutes. What I do believe will happen is that there will be considerable dissatisfaction with the very hard-Brexit that I think is going to be the only one on offer. That may not lead to another referendum but I think it will certainly lead to general election at which the only Brexit on offer will be presented as a take it or leave it deal. The Scots voted to stay in and it is clear that there is no appetite now for a repeat of the Scottish referendum as far as the SNP are concerned because they will lose it again. I don’t think, however, that that is forever and I don’t think that the result of the referendum was forever. The Scots were lucky that they didn’t vote for independence because the oil revenues have since collapsed and their economics just don’t work now. However had they been now working for independence the whole thing would have fallen into a real mess just like the Brexit is following into real mess. As someone who has been strongly antinationalist all his life I’m not prepared to give up the European Union which, warts and all, I think is a lot better than the UK drifting up and away from Europe. Sorry, I’m not giving up and I hope many others won’t give up! Thank you for your comment nonetheless.